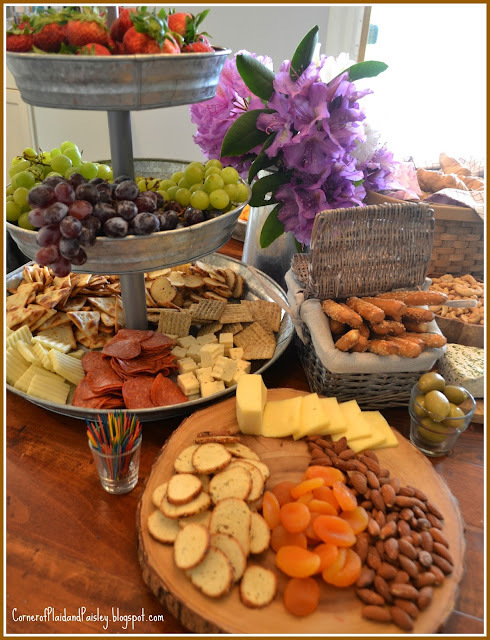 Are you throwing a party and want a simple way to do the appetizers? Consider a cheese, cracker and/or charcuterie tray. We recently had a party to show off our new kitchen. I really did not want a mess of dishes in the sink and on the counters for this party and I was looking for an easy way to have some appetizer, so I decided to turn my kitchen table into a big cheese and cracker tray. this way everything could be cut up and washed early in the day and stored in the fridge and cupboard until just before the party started. My girlfriend cut some azaleas from her yard that we used for our centerpiece. We like to call this a charcuterie tray - just because it the word charcuterie sounds so fancy. But truly a charcuterie tray has more meats and is usually served on a wood board. I only included some hard salami, summer sausage and pepperoni on my table and used a variety of trays. 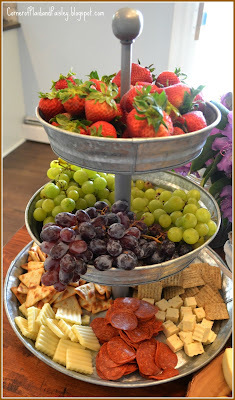 To give the display some height I used my three tier galvanized tray and filled the top two tiers with fruit. 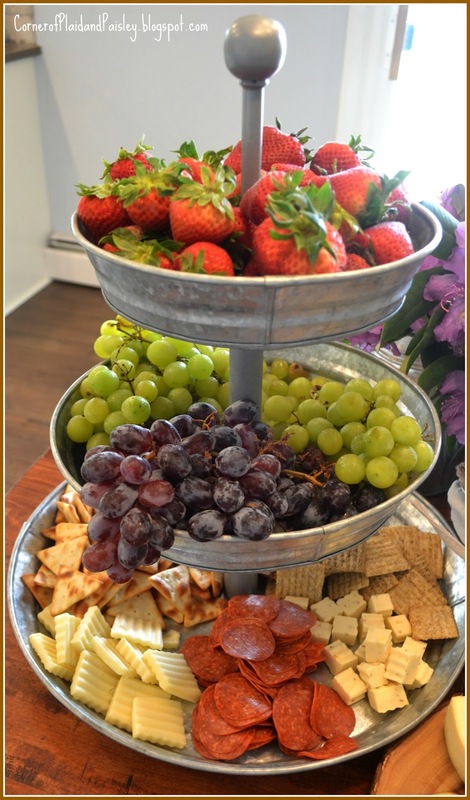 The bottom tier is several different cheeses, crackers and pepperoni. 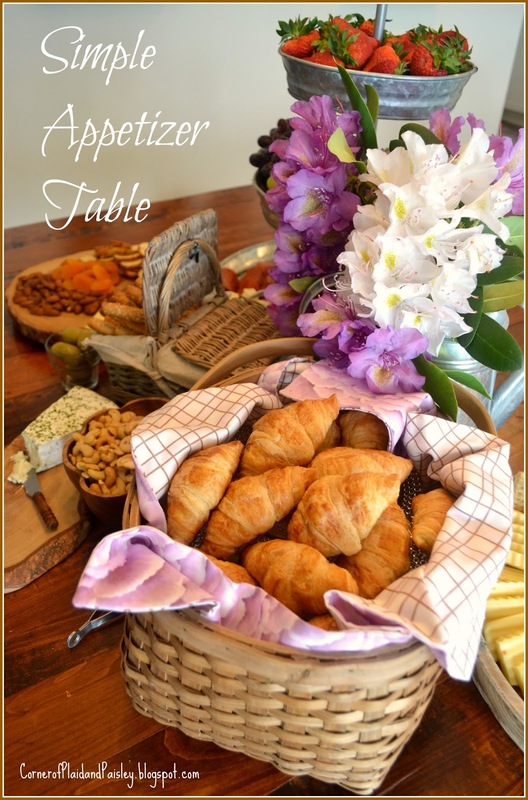 To add texture to the table I used a couple of different weave baskets, one to hold some mini croissants and the other is holding some sesame stick crackers. A little trick I used for these baskets is to take a glass dish that will fit down in the basket and turn it upside down just to take up some room in the bottom of the basket. That way you don't have to fill the entire basket with the food item. If you use a clear glass dish - it still looks half way decent if you should run low on what ever is in the basket. 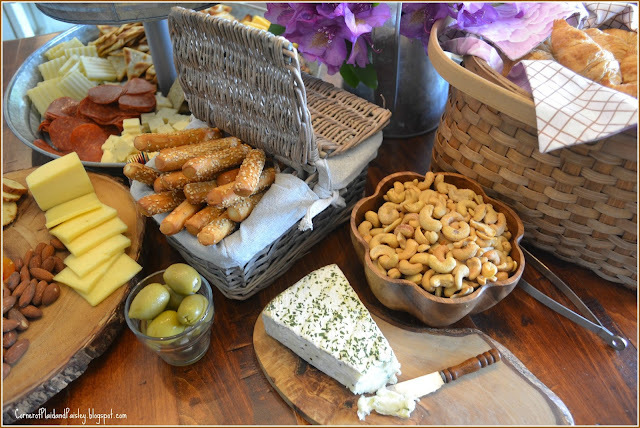 Start your table by laying out your cheeses so that they are room temperature by the time your guests arrive. Then fill in around the cheeses with different varieties of crackers and nuts. I also added some dried apricots for some color. Olives can be a big part of a display like this, but I really don't care for olives, so I went very sparingly on those! Using a variety of trays gives it interest, but staying in the wood and grey tones of all the serving dishes gives it some cohesiveness. I hope this gives you some ideas for your next party! What a great spread! I love to entertain like this and your display is a masterpiece for the eyes and the tummy! Ann, what a beautifully presented table and easier clean-up. Wishing you a wonderful week! Hi Ann, you have created a beautiful spread with cheese, crackers and fruit. My husband loves snacks and this would make him extremely happy. 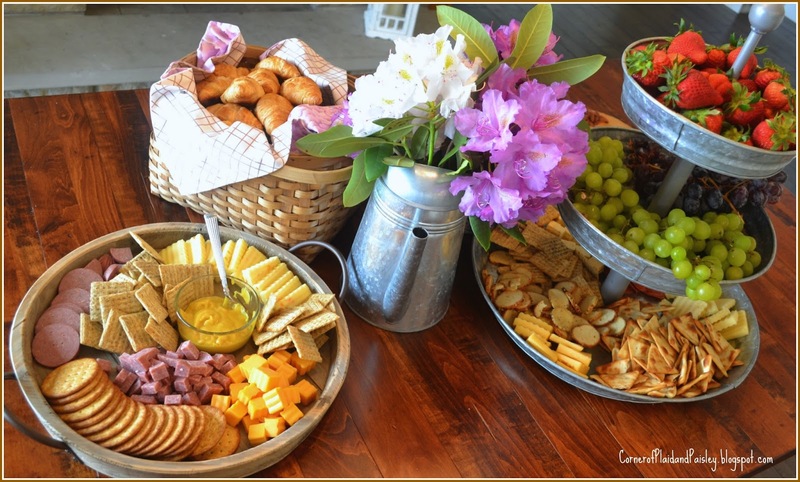 Thanks so much for sharing your beautiful cheese board at Dishing It & Digging It. This is great for entertaining year round but especially this time of year. Who wants to turn on a hot oven! Hello Ann, I thought I would leave you another comment I am featuring this post at our party this Sunday, Dishing it & Digging It. Happy Memorial Day weekend. You just made my day Linda!!! Thank you so much!!! 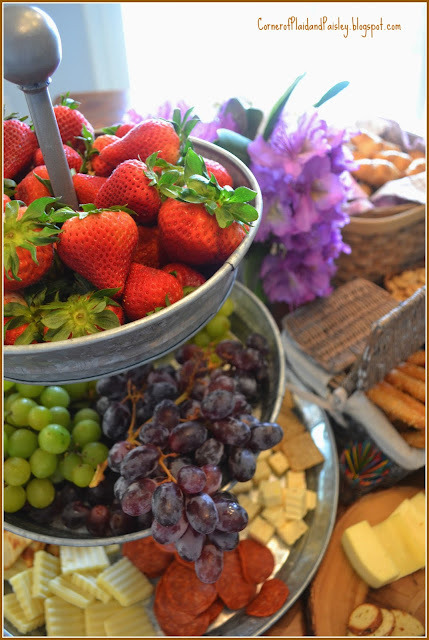 Everything look delectable.........and so well thought out. Here is to easy entertaining, I think it makes life so much easier......and so much more doable most of the time. Can't imagine anyone not enjoying this spread. Hi Ann! This looks like the perfect idea for any party. 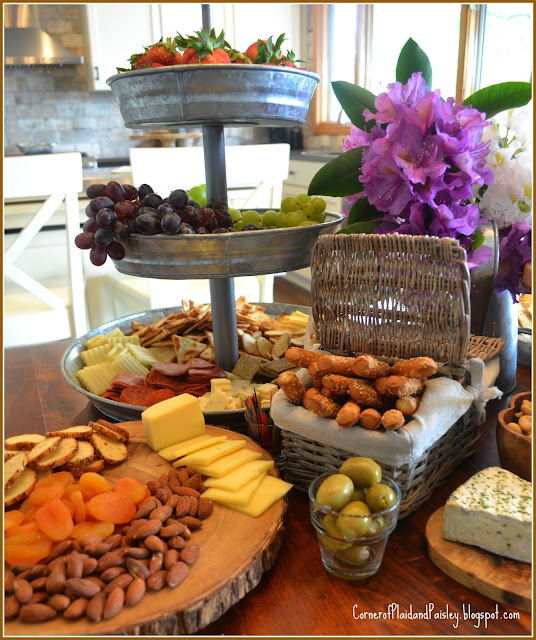 Who doesn't love some delicious appetizers? I am definitely going to give this a try for upcoming celebrations. Thank you so much for sharing with us at Dishing It & Digging It & congratulations on being featured this week!